I've been working up photos today from Destination: Fort Smith. 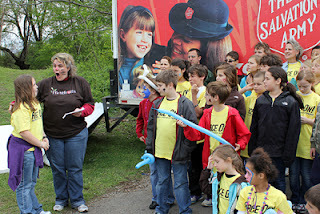 This photo from Friday's outreach carnival is one of my favorites. I snapped this right after Emma handed the Salvation Army rep (Terri) the Visa gift card(s) with the donations we set aside for the ministries we help during the mission trips. It was a good experience. At least half of the students involved in Destination: Fort Smith were completing their first mission trip. They grew. They learned. They stepped out on faith - and they had fun. I'm sure I'll have more as I continue to process this experience. For now, Destination: Fort Smith is in the books. Wednesday Funny: Easter Egg App?